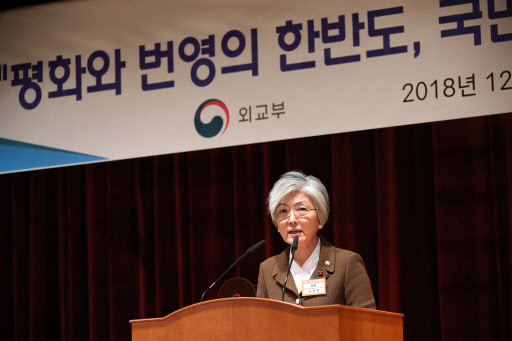 South Korean Foreign Minister Kang Kyung-wha called on South Korean ambassadors and consuls general Monday to increase their diplomatic efforts to achieve complete denuclearization of North Korea and establish peace. “Now, we are facing an important opportunity for a resolution to the North Korean nuclear issue,” Kang said at the opening of the annual meeting of some 181 ambassadors and general consuls abroad. “The journey, going forward, will not be smooth, but I believe in the power of our diplomacy,” she said, vowing to create a virtuous circle of inter-Korean conciliation and progress on denuclearization. Major programs include special lectures by Yoon Young-chan, senior presidential secretary for public communication, and Yoon Jong-won, senior presidential secretary for economic affairs. National security adviser Chung Eui-yong plans to brief the envoys on the foreign and security policy direction of the Moon administration. They are also to discuss ways to reform and streamline the ministry’s personnel structure, where power is concentrated on a few high-ranking officials, in an effort to make it more responsive and efficient. The meeting comes amid international efforts to achieve denuclearization of North Korea after years of tension and hostilities heighted by North Korea’s continued nuclear weapons and missile tests. This year, South Korea has pursued an improvement in inter-Korean relations and denuclearization of the Korean Peninsula in parallel, though the fast fast-pace of inter-Korean developments in comparison to progress in other areas raised concerns over a rift in South Korea-US coordination. South Korea’s role has been highlighted in brokering talks between North Korea and the US, which held their first historic summit in June in Singapore, and providing momentum for peace efforts in the region. With a focus on easing cross-border tensions and bringing lasting peace to the peninsula, the Moon administration has striven to enhance cooperation with regional powers -- the US, China, Japan and Russia -- but also tried to expand its diplomatic scope beyond the region.